Back in the late 80's and early 90's, I was a dyed-in-the-wool Apple and Macintosh bigot. If Apple made the product, I was convinced that it had to be better than anything else out there. Guy Kawasaki was Apple's "Chief Evangelist" responsible for spreading the word about Apple's products, so he was someone I grew to like and respect. Although I'm no longer the Apple bigot I was in those days (I primarily use Windows and Android, though I do own an iPad), I still think Guy is pretty cool and still listen to what he has to say. When I learned that he had put out a book on self-publishing, I had to read it. A.P.E. stands for "Author, Publisher, Entrepreneur" and represents what any self-published author should consider himself or herself to be. As the author, you're responsible for writing and revising the book. As the publisher, you've got to concern yourself with hiring good editors, acquiring cover art, and designing the book's interior. As the Entrepreneur, it's your job to make sure that you earn a profit from all your hard work. With Guy's help, that should be a lot easier. A section on how to format the text for the widest possible compatibility across eBook readers, starting at Microsoft Word and ending with Adobe InDesign is extremely useful. He also covers how to convert the file for each eBook service, and how to upload it to them. The book provides links throughout the text to many useful resources, including recommended writing/editing/publishing books, crowd funding sources, sites where you can find contractors to help, where to get a good cover, etc. Some of these are affiliate links, providing another way you can monetize an eBook. The final section talks about how this book itself was created. They used MacBook Airs and iMacs with Microsoft Word to write it, with Dropbox to maintain backups and share versions of the book. Adobe InDesign CS6 was used to design and produce the Kindle, ePub, and print-ready PDF files. They hired an independent artist to do the cover. Editing was crowdsourced to Google+ and Facebook. A professional copyeditor took care of the final editing. To promote it, they relied on blog reviews, NetGalley (a service that emails bloggers and journalists), asked readers for Amazon reviews, used social media, hired a PR firm, did press interviews, held a few live online events, and set up a Google+ community. I've been studying eBook publishing for a few years now. I've had the opportunity to learn from several authors who have made a living at self-publishing from back in the earliest days of eBook (before the Kindle). They have taught me a great deal, but I learned more from reading Guy Kawasaki's book than I've learned from all of them, to date, combined. 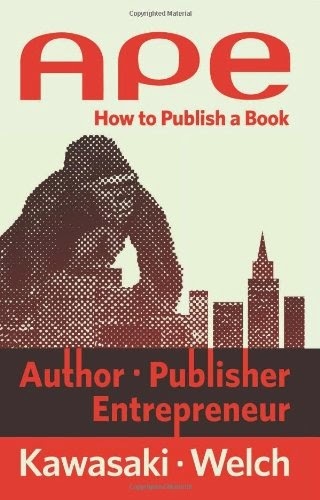 If you're thinking about self-publishing a book through Amazon, Barnes & Noble, Kobo, etc., the $9.99 you pay for this book will be money well-spent. You'll get good tips about every step of the process from writing through to promoting and publishing. I strongly recommend it!